On Friday night, February 2nd, the New Albany School District designated the home basketball games versus Ripley High School to be a “Benefit Basketball Night” with a portion of the gate receipts being donated to the local New Albany Boys & Girls Club. This gesture by the New Albany Schools is a wonderful example of the spirit of cooperation and support that exists between the school district and the local Boys & Girls Club. 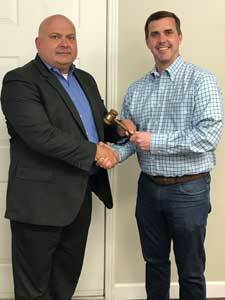 Pictured (right) is Brad Clayton, Past President, passing the gavel to Rainey. At the April 2 School Board Meeting, David Rainey was elected to serve as President of the New Albany School Board for the next year. Mr. Rainey has served on the School Board since January 2017.